HEADLINE: "MEGUIAR'S UNIGRIT SYSTEM MAKES SANDING EASY!" I'll be the first to admit that sanding delicate, finicky, or thin objects can be intimidating. Take automotive paint, for example. Most factory applied paint jobs are literally as thin as two or three sheets of writing paper! It gets worse- a majority of the paint systems these days are comprised of a primer coat, at least one color coat, and a clear coat of paint. What does this mean in terms of our ability to safely sand defects or texture away? It means it can be downright scary! If, through sanding, you happen to remove too much of the top coat, the longevity of the paint may be compromised. Sand through the clear coat, and a simple "Oops!" cannot begin to describe the extent of this seemingly minute mistake. Bottom line- prepare to spend big bucks in order to properly straighten things out if you sand through the top coat. The good folks over at Meguiar's are well aware of how risky sanding automotive paint can be. After all, they make all sorts of paint care products. In fact, Meguiar's Unigrit® Finishing Papers are world renowned, and are truly the benchmark to which all other sanding sheets are compared to. So when Meguiar's decided to develop a sanding disc system, they once again topped themselves by creating an entire line of Unigrit™ branded products. Most notable are the all-new Unigrit™ Sanding and Foam Finishing Discs, which are safe to use on automotive paint and plastics (such as headlight and taillight lenses). There are actually two separate sanding systems within the Unigrit™ System. One is for sanding paint, while the other is for sanding hard plastics. For specific recommendations pertaining to 3" discs, click here for a look at the Meguiar's Spot Repair Chart. All about Meguiar's Unigrit™ Discs. As you might expect, Unigrit™ Sanding Discs don't have the ability to flex or contour as well as Unigrit™ Foam Finishing Discs, but they will level a surface much more efficiently. For jobs requiring the leveling of paint texture (commonly referred to as orange peel) on curved or complex shapes, implementation of a Unigrit™ Interface Pad between the disc and backing plate will increase conformability to the surface. But, there's more to these discs than just foam, or the lack of it! The foam helps to better distribute applied pressure across the face of the disc. This ensures a consistent cut of the surface being sanded. The foam allows the sanding particles to easily conform to complex shapes and curved surfaces. Because of this, Unigrit™ Foam Finishing Discs perform incredibly well for the task of texture matching. The foam provides a capillary effect for water distribution and management. It doesn’t just store water…it manages the flow of water, which is essential for lubrication of the sanding surface. The "on board" water management system also keeps the disc and sanding surface clean, flushing away abraded paint residue and loose particulate as you work. Regardless the type of Unigrit™ disc you choose, rest assured that you've got cutting-edge technology at your fingertips! Sand by hand or machine... it's up to YOU! 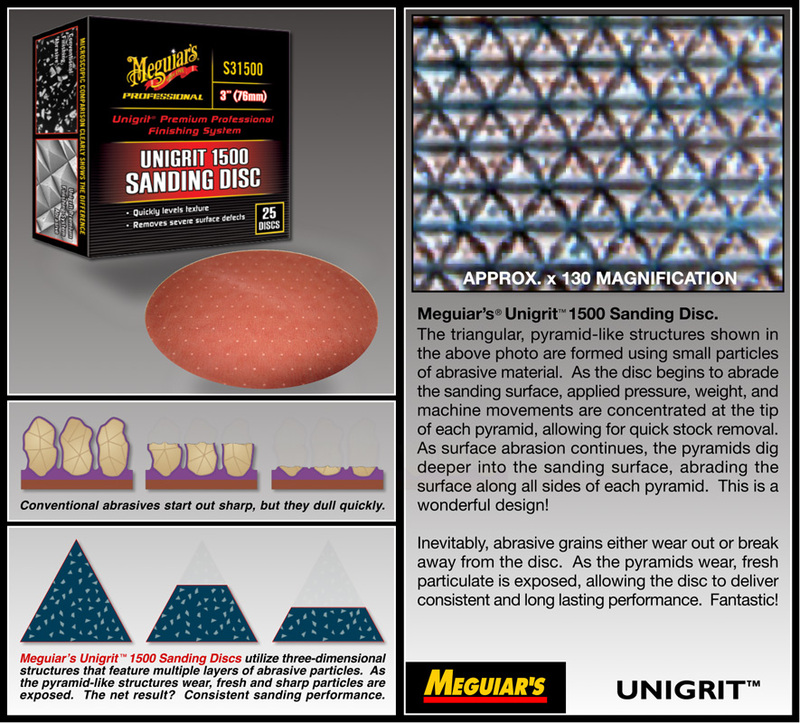 Since not all sanding tasks require the implementation of a machine, Unigrit™ discs can be used by hand. To optimize sanding performance, Meguiar's offers 3" and 6" Professional Hand Pads. Simply attach the disc to the ergonomically designed pad, and get to work! Meguiar's Unigrit™ Interface Pads and Backing Plates take away the guesswork. You've chosen your discs, but how will you optimize machine sanding performance? Use the correct backing plate and interface pad! The pros at Meguiar's thought of everything, and tailor made Unigrit™ Interface Pads and Backing Plates to work in tandem with Unigrit™ Discs. Of course, they work well with other brands of sanding discs, too.